The Hero Destini 125 goes toe to toe with its key rivals – the Suzuki Access 125 and the Honda Activa 125. Let's take a quick look at how Hero's new flagship scooter fares against its competitors to see if it can disrupt the 125cc scooter segment in India, despite its late arrival. 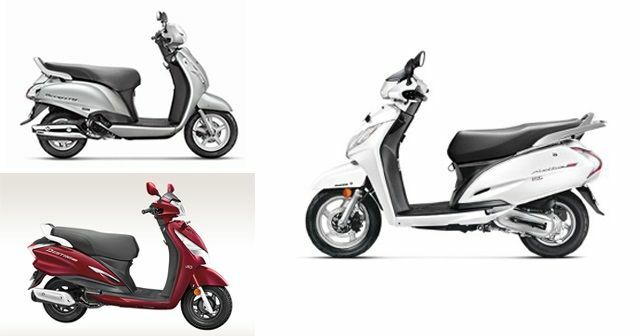 With a recent surge in customers’ interest in the 125cc scooter segment, manufacturers are very much shifting their focus to bring in more products into their portfolios, which offer more power and premium features. And, the 125cc scooter seems to be the best option to incorporate these offerings. However, the biggest question that needs to be answered here is that whether Hero's late arrival to the scene with the Destini 125 is a good move or not, keeping in mind that it will compete against the likes of the Honda Activa 125 and Suzuki Access 125. To put things into perspective, the Honda Activa recently became the first scooter in India to cross the two-crore sales mark. That's the enormity of the challenge which lies ahead of Hero MotoCorp. So, without further ado, let's take a look at how the three compare. Interestingly, all three scooters are priced under ₹ 60,000. Kicking off the proceedings with the dimensions, the Destini 125 offers the shortest wheelbase amongst the three at 1,245mm. This should offer better manoeuvring through tight spots. While the Access 125 is the longest out of the three at 1,870mm, it’s also the slimmest at 655mm. The length should make the Access 125 more spacious and comfortable in terms of legroom and seat length. The Access 125 also edges past its rivals, as it offers marginally higher ground clearance at 160mm. And at just 102kg, it’s also the lightest amongst the three. However, the Activa, at 108kg, offers a full-metal body. The Destini 125 is the heaviest out of the lot at 111.5kg, which means it won't exactly offer a peppy performance. All three scooters are powered by 125cc air-cooled, single-cylinder motors with pretty similar power outputs, which does not leave much to compare. However, the Activa has the highest torque figure of 10.54Nm out of the three. This should make the Activa a bit faster off the line. All three scooters come with electric and kick start options, and all of them feature telescopic suspension up front. The Destini 125 has the lowest starting price out of the three at ₹ 54,650, which can be attributed to the fact that it misses out on some premium features, such as front disc brakes and LED headlamp. However, if you can live without these creature comforts, then the Destini 125 certainly brings to the table good value and decent performance.